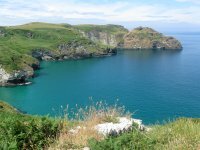 This is a stunning walk starting from the spectacular location of Tintagel with it's castle and heading north along one of the most beautiful parts of the coast, passing Rocky Valley to the beautiful harbour village of Boscastle, a welcome refuge for boats on this rugged part of the coast. 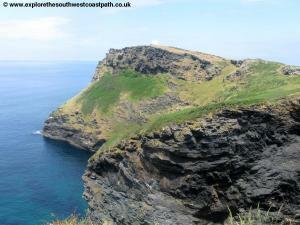 North of Boscastle the path becomes steeper and the cliffs higher, offering some stunning views. 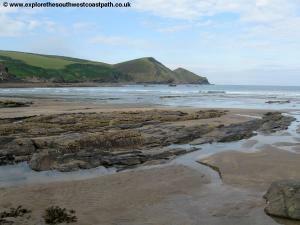 The walk ends at the small village of Crackington Haven with it's narrow sandy beach. From the A39, the main road through North Cornwall, if coming from the north take the exit onto the B3263 just south of Wainhouse Corner. You then keep on this road for around 10 miles. 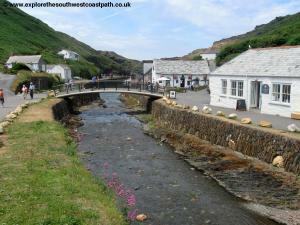 You pass through Boscastle on the way. Note that this road is very hilly and narrows to single track in places, so care is needed. If you are coming from the south take the A39 to Camelford and then in Camelford turn left onto the B3266 (signed for Tintagel). After around a mile you come to the junction with the B3314 where you turn left and then almost immediately after this, you turn right onto the B3263 which you then follow into Tintagel via Trewarmett and Tregatta. 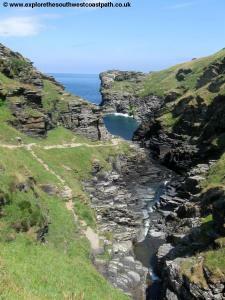 There are many car parks in Tintagel, simply park in one of the numerous pay and display car parks. Tintagel is served by Western Greyhound bus service 594. 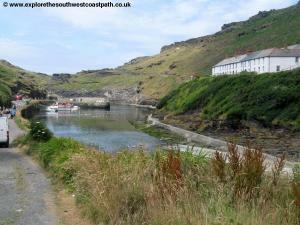 This runs a broadly hourly service Monday - Saturday between Camelford, Boscastle and Tintagel. Most of these services start at St Colomb Interchange and travel via Wadebridge to Camelford and on to Boscastle and Tintagel. 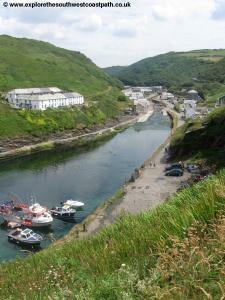 Some of the buses also start in the north from Bude and travel via Crackington Haven to Boscastle and on to Tintagel and Camelford. There are connections at St Columb Major for Newquay and Truro. On Sundays during the winter the bus runs 4 times daily between Bude, Crackington Haven, Boscastle and Tintagel and more frequently on summer Sundays. For details of service see the links below. 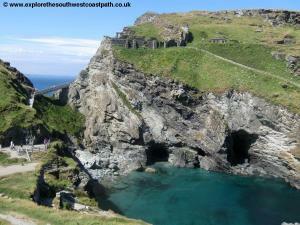 Tintagel has a good range of accommodation from large hotels to small B&Bs, caravan and camp sites. 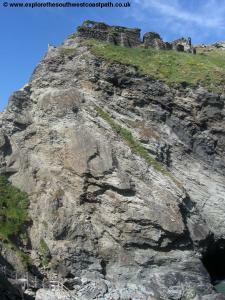 For details see the links below or call the Tintagel Tourist Information centre on 01840 779084. For details, see the following links. 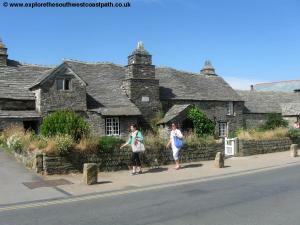 Tintagel is a beautiful village with many old and attractive buildings, in particular the old post office, now owned by the National Trust. You cannot escape the legend of King Arthur and the many associated gift shops in the village, as the legend of King Arthur was said to be at Tintagel Castle. 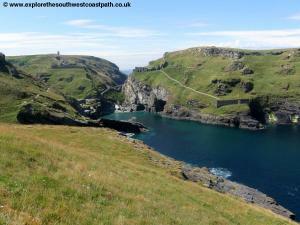 From the centre of Tintagel head west along Fore Street and then as the road forks right ahead (to Atlantic Road) go straight on down hill along the narrow Castle Road. Follow this road right down to the castle visitor centre where there is also a shop and toilets. There is a land-rover shuttle service along this road but otherwise little traffic so it is an easy start to the walk. At the end of the road there is the entrance to the castle on the left. The castle is owned by English Heritage and is well worth a visit, not least for it's spectacular setting on this beautiful part of the coast. 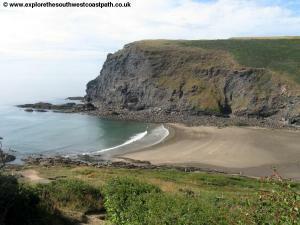 It is also worth taking the stairs down to the little bay, where there is some sand at low tide, many rocks and caves. At the end of Castle Road take the path up to the right, past a viewing area and then on along the coast, signed as for the Coast Path. 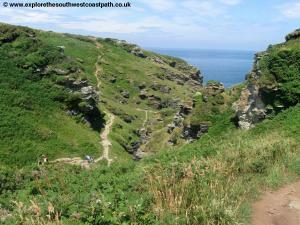 Follow the obvious coast path that now follows the cliff top with some stunning views of the castle and back down to the bay. 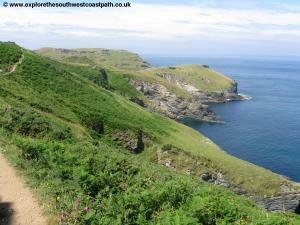 Ahead you soon come to a headland, Barras Nose which a path goes out to the end of, although this is not the official route of the coast path, but is worth taking for the stunning views. 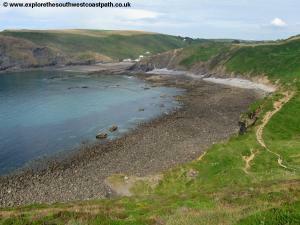 The official route of the coast path is right, bypassing the headland heading SE. Keep on the path closes to the coast here, as another goes a slightly more inland route. 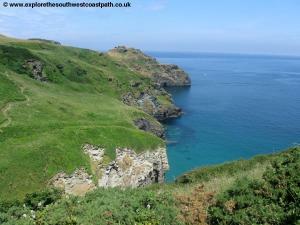 The path now climbs steadily towards Smiths Cliff around a wide bay with The Sisters cluster of rocks just off the headland at the end, another stunning view. As you round Smith's Cliff the path joins the edge of fields, with a stone wall on the right, still right on the cliff top. Ahead you come to the next headland, Willapark. 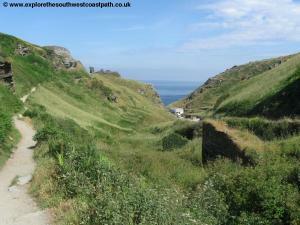 Again, the coast path cuts the corner here, but a footpath goes left through a gap in the wall out to the end of the headland where you have views back to Barras Nose. 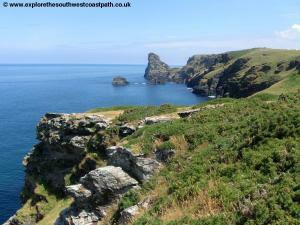 The coast path from here now turns and heads SE, descending into a steep valley at Bossiney Haven. 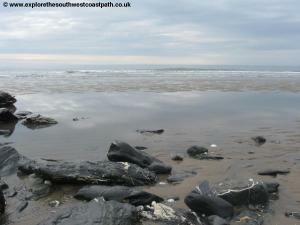 On the left a path leads down to the beach and adjacent Benoath Cove, but at high tide both beaches are covered. 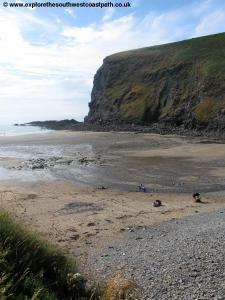 At low tide they are sandy and sheltered. At Bossiney Haven the path climbs back up the other side of the valley cutting the edge of the rocks between Bossiney Haven and Benoath Cove and following the cliff top right behind Benoath Cove. You follow the cliff top heading north and then descend down once more to another very spectacular valley, Rocky Valley, now in the care of the National Trust. At the base of the valley you have views over the rocks to the coast. Cross the stream through the valley via the footbridge and follow the path that zig-zags up the other side initially heading inland and doubling back. 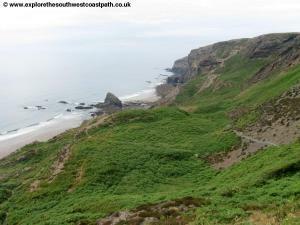 Head NE and follow the path alongside the edge of a camping and caravan site on the right now right on the cliff top, past a very rocky inlet (Trewethet Gut) and then follow the path as it returns to the cliff top. The path now follows along the top of this very rocky part of the coast past numerous little islands of rocks, including Long Island and Short Island. Keep to the path around the headland passing a house on the right, Manor House. 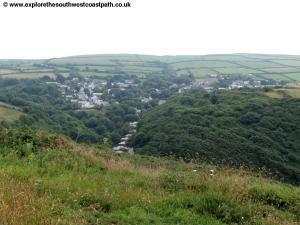 From the top here you have fine views around the bay and a white tower can be made out at the other end of the bay, Boscastle Harbour is just beyond this. 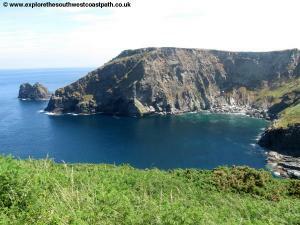 Keep along the coastal path and at the junction with the road to Trevalga, turn left and keep to the path along the cliff top heading north. You come to a stone wall and follow the path along the coastal edge of the field, although many people have clearly taken a shortcut right across the middle of the field. 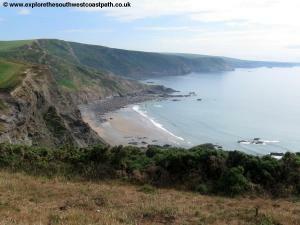 At the SE corner of the field exit and follow the coast path as it descends around another little valley, Grower Gut. Follow the path as it twists and turns it's way back up the other side. 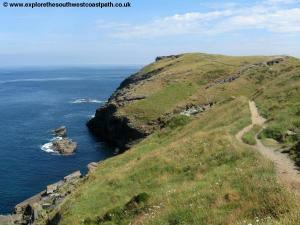 Keep to the obvious cliff top path as it runs alongside several fields and passes behind another rocky inlet, Western Blackapit on the left. Keep to the path beside fields on the right. On the left is another headland, also called Willapark with the obvious white tower at the top, now a coast watch station, the headland is also the site of an ancient settlement. 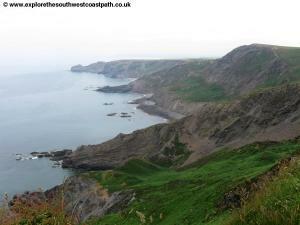 The coast path doesn't go out onto this headland, but it is worth making the diversion to do so as the views are stunning. 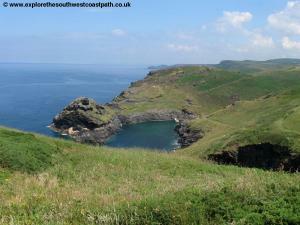 Returning from this headland the coast path goes around another rocky inlet and then descends slowly into the sheltered cove of Boscastle Harbour. 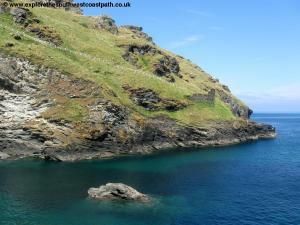 Take the path down along the cliff top above the road with the harbour and it's breakwaters below. As you pass above the first building on the left take the path down to the road rather than keep straight ahead, which joins the main road. 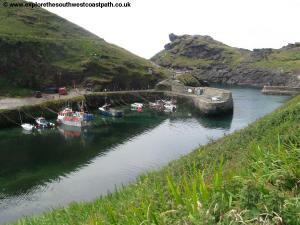 Descend down to the harbour and follow the path along the south side of the harbour wall into the centre of Boscastle. 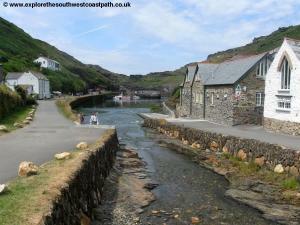 Boscastle is a beautiful village with many white-painted buildings with slate roofs made from the local slate. However on the 16th August 2004 the stream flowing through the village became a raging torrent after heavy rain funneled the water through this deep valley. The resulting flood destroyed several of the buildings in the village and damaged many others as well as washing many cars into the harbour and out to sea. The buildings have now been re-built and repaired and a new footbridge built over the stream, replacing the ancient stone bridge that was destroyed in the flood. Videos of the flood can be viewed in the visitor centre. Today the scene is thankfully much calmer and you proceed along the path beside the harbour until you come to the new footbridge which you cross on to the north side of the harbour. Once over the bridge turn left and as the road splits, with one part going down to the harbour beside the youth hostel and the other climbing to the right of the youth hostel, take the higher path, going in front of a row of houses on the right. Beyond this the road narrows to a path which you follow ahead. 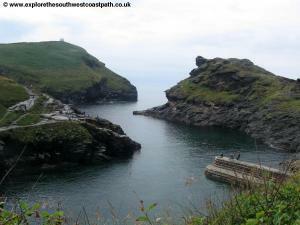 After a short distance as you approach Penally Point at the north side of the harbour the path splits with one path doubling back and climbing away to the right, take this path heading SE and climbing away from the harbour, soon with the sea on your left once more. For the next half mile or so the coast path follows close to the coast on the left with the edge of fields on the right, a little back from the cliff top. After passing a couple of fields you come to another little inlet, Pentragon where the path turns right and then almost immediately back left along the cliff top. You follow the path as it keeps to the cliff edge turning left into a valley where you drop right down to sea level coming to a stream which forms a waterfall over the cliffs. Follow the path as it heads a little inland crossing the stream via a footbridge and then climbs steeply back up the other side soon turning left and keeping to the cliff top once more. Follow the obvious cliff path along Beeny Cliff keeping close to the cliff edge and soon with the field fence on your right. As you come to Fire Beacon Point and round the corner you have a glimpse of the spectacular rocky cliffs ahead. Beyond this point the cliffs drop away more gently to the left, but you always keep to the cliff top and do not attempt to go down the grassy cliffs. At Saddle Rock the cliffs again becomes steep with a rocky gully below to the left but you keep to the path across the field here slightly back from the cliff top. Keep to the cliff top path rounding the rocky beach at Buckator. 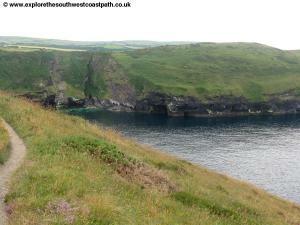 Ignore the path off to the left descending down the cliffs here as the coast path sticks to the top of the cliffs. Follow the cliff top east from here with a house close by on the left. Ahead the path now does briefly descend from the cliff tops. It winds about a little below the top of the cliffs, but does not descend down to the beach. Keep to the coast path signs, marked with an acorn always keeping grass beside rather than any slate. 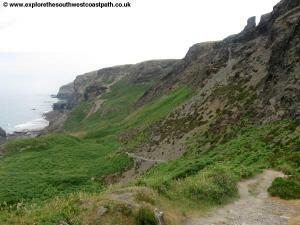 The path then climbs back up to the cliff top, known as High Cliff and then you keep north. After around a half mile along the cliff top the path again drops slightly below the cliff top near the village of Trevigue, where a track leads off to the right to this hamlet. 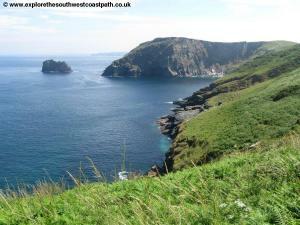 To the left a footpath goes down the cliff face to the beach of The Strangles. 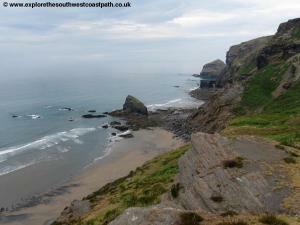 Here a very steep stepped path leads left down to the beach. This is a fine sandy beach but mostly covered at high tide. It's remote location means it is never busy and is a stunning remote little beach, but be aware that it is a long way down and back up along a narrow path. 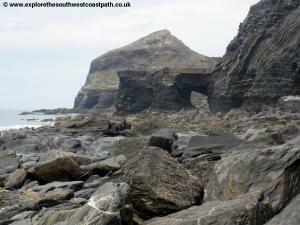 One the beach you have views of the arched rock of Northern Door at the north end of the beach, beyond Samphire Rock. Returning to the coast path you now return back to the cliff top above these two beaches, soon getting fine views of the beaches to the south. At the headland to the north there is another waterfall over the cliffs. 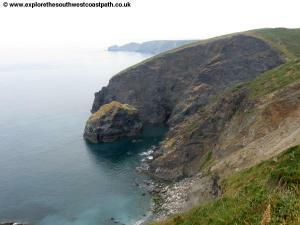 The path rounds the headland, but again sticks to the top of the cliff, so do not take any paths descending from the cliffs. 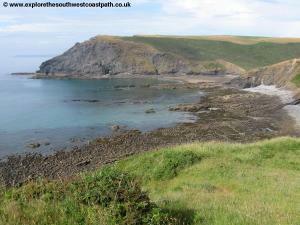 Rounding the headland you are now heading east with fine views down to your destination, Crackington Haven. 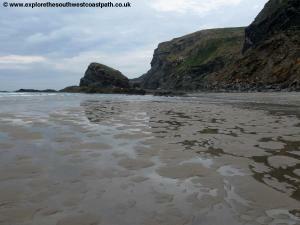 The bay is initially rock and pebbles but towards the village at low tide there is a good sandy beach. 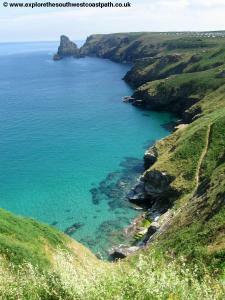 Follow the cliff top path as it descends down to a little valley of Tremouth Haven and then back up the other side, keeping to the cliff top. Keeping to the coast path you pass close to the road on the left, but keep to the cliff top soon descending down to the village and down to the road, from where there is access to the beach. The village itself has a pub and a couple of shops. To get back to Tintagel bus services 594 and 595 run around once every two hours , seven days a week, from Crackington Haven back to Tintagel. 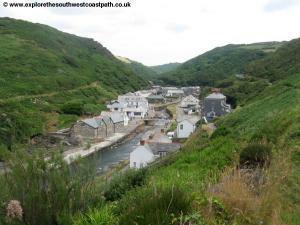 You may have to change buses in Boscastle, but the service is normally worked by the same bus and driver on from Boscastle, but check with the driver when boarding. Even if you do have to change buses it is a connecting service and through tickets are available. The journey takes around 25 minutes. Check the times before departing however as the bus does not run very frequently and does not run during the evening. For details see the link below. Ordnance Survey Explorer map 111 covers this area of the coast path and is available from most book shops nationwide and many local shops including in Tintagel and Boscastle. 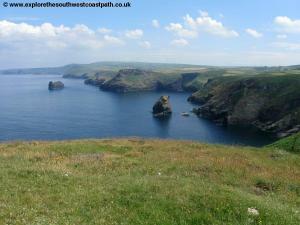 Streetmap is a web site which provides maps of the UK, including the area between Tintagel and Boscastle. 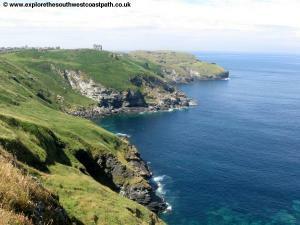 The links below cover the coast between Tintagel and Crackington Haven.